Sweet potatoes are a staple of the Thanksgiving meal, but like all longstanding traditions, sometimes it’s nice to change things up a bit. This sweet potatoes recipe incorporates Marker’s Mark for a little extra pizzazz. Enjoy! Prep Time: 15 minutes. Cook Time: 30 minutes. Level: Easy. 1. Place diced sweet potatoes into a large pot and cover with cold water. Add salt to the sweet potatoes and bring to a boil. Simmer the potatoes for approximately 25 minutes or until just tender, not too soft. 2. Drain the potatoes until dry and place them back into the pot. Stir in the 1Ž2 cup of butter and the Maker’s Mark® while the potatoes are still hot. As you stir the potatoes they will naturally mash and still hold some of their shape. Season the mixture with salt and pepper to taste. Transfer to a ceramic serving dish and hold. 3. Prepare the chestnuts by first melting the 2 tablespoons of butter into a sauté pan and sauté the celery on a medium heat. After 2 minutes add the chopped chestnuts and the maple syrup to the celery and cook together until incorporated. Finish the chestnuts with the sage and season with salt and pepper. 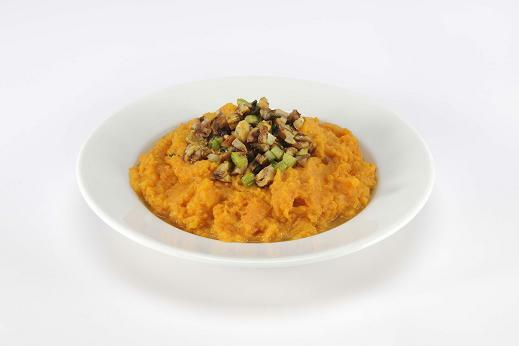 Spoon the chestnut mixture over the sweet potatoes and serve.